Enormous financial and technology hurdles continue to plague the development of 450mm wafers. Ambitious goals to put 450mm wafers to use have been scaled back. IC manufacturers are instead maximizing their manufacturing efficiency using 300mm and 200mm wafers. 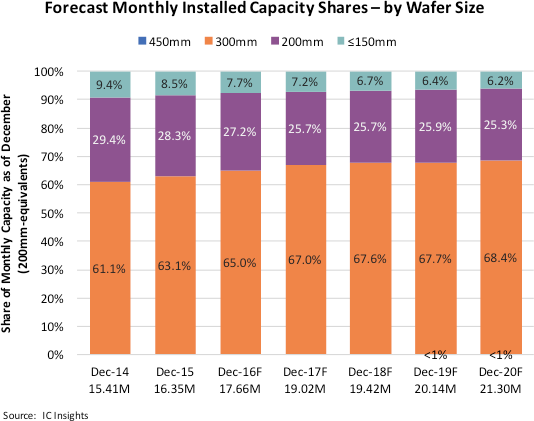 IC Insights’ Global Wafer Capacity 2016-2020 report shows that worldwide capacity by wafer size was dominated by 300mm wafers in 2015 and is forecast to continue increasing through 2020 (Figure 1). • 300mm wafers represented 63.1% of worldwide capacity at the end of 2015 and are forecast to increase to about 68% by the end of 2020. • The share of the industry’s monthly wafer capacity represented by 200mm wafers is expected to drop from 28.3% in 2015 to 25.3% in 2020. But, 200mm wafer capacity is predicted to increase every year over the next several years. • Capacity for wafers of ≤150mm diameter is forecast to remain relatively flat during the forecast period. The number of 300mm wafer fabrication facilities in operation is forecast to keep increasing through 2020 (Figure 2). For the most part, 300mm fabs are, and will continue to be, limited to production of high-volume, commodity-type devices like DRAMs and flash memories; image sensors and power management devices; and complex logic and microcomponent ICs with large die sizes; and by foundries, which can fill a 300mm fab by combining wafer orders from many sources. • The number of active volume-production 300mm fabs declined for the first time in 2013. A few fabs that were scheduled to open in 2013 were delayed until 2014. In addition, two large 300mm fabs owned by ProMOS closed in 2013. • At the end of 2015, there were 95 production-class IC fabs utilizing 300mm wafers (there are numerous R&D IC fabs and a few high-volume fabs around the globe that make “non-IC” products using 300mm wafers, but these are not included in the count). • Currently, there are eight 300mm wafer fabs scheduled to open in 2017, which would be the highest number in one year since 2014 when nine were added. 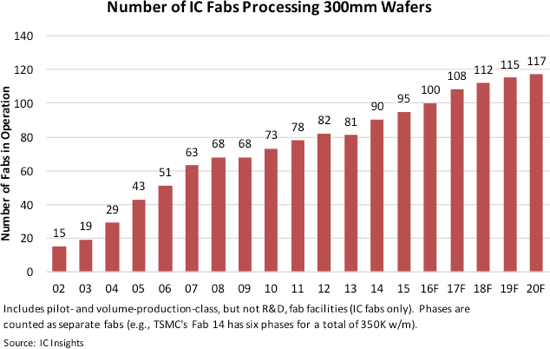 • By the end of 2020 there are expected to be 22 more fabs in operation, bringing the total number of 300mm fabs used for IC fabrication to 117. The peak number of 300mm fabs may be somewhere around 125. For comparison, the most volume-production 200mm wafer fabs in operation was 210 (in December 2015 there were 148).